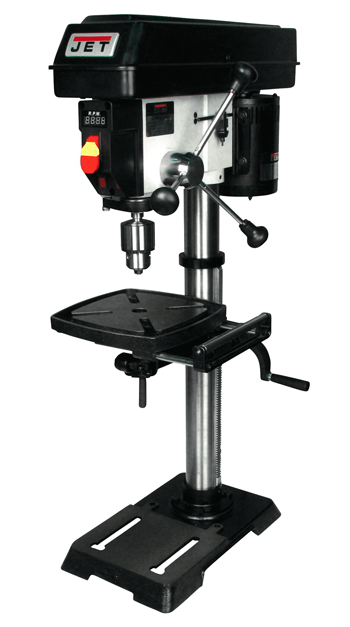 JET JDP-15F, 15” Floorstanding Drill Press. From a full 3-1/8” of spindle travel to the sturdy cast iron head with a poly v-belt drive system, this drill press is designed to perform. This drill press also features a one-handed belt-tensioning system and a large 12-1/2" x 17" work table. Base Size: 18-7/8" x 11-3/8"
Chuck Distant to Base: 42-7/8"
Chuck Distant to Table: 25-7/8"
Spindle Distant to Base: 46-1/4"
Chuck Distant to Base 43-13/32"
Chuck Distant to Table 24-1/2"